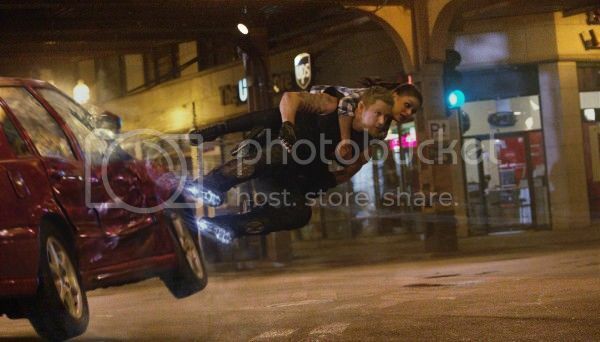 Originally slated for a July 2014 release but pushed back eight months to reportedly polish off over 2000 special effects shots, The Wachowski’s Jupiter Ascending – their follow-up to the audacious, time-spanning Cloud Atlas – has finally arrived in cinemas, only with a foreboding aura that’s been hovering over it since the news was announced. It’s not often a film gets pushed back so far mere weeks before release; it’s a glaring indication that something’s wrong, and if there’s one thing evident throughout this film, it’s that eight months clearly wasn’t long enough. Cloud Atlas – coming from someone who admired but wasn’t won over by it – looks like a masterpiece in comparison. You can decide how that makes The Matrix look. It’s a classic example of a film aiming high but reaching none of its goals. The Wachowskis, still visually astute filmmakers forever pushing the boundaries of story and special effects, appear to have finally stumbled into a wall of mediocrity. If Cloud Atlas didn’t entirely work, it still had a real maturity and arrestingly ambitious quality to it. There are inclinations of something grand and spectacular permeating beneath Jupiter Ascending, but it never even comes close to giving the audience a reason to actually think about it, and really it feels like a film that’s simply not ready to be shown. Imagine a wad of pizza dough stretched out into a log and someone hacking out sections with a cleaver. That’s how it plays out; it’s such a clunky, rushed, disjointed narrative. We never have much of an idea of what’s happening or where it’s going, it just skips between set-pieces with barely a thought in between. Those set-pieces generally equate to little more than glittery, effect-heavy action sequences of Channing Tatum skiing around on hover boots and Mila Kunis falling from heights. They must have spent those extra eight months literally doing nothing but tinker with the effects because they really are plentiful and impressive, it’s just that the scenes they’re supporting spectacularly fail to impress. If the careless, throwaway dialogue in between wasn’t so uninspiring, they’d be running away with the dullest moments of the film award. Then there’s the issue of not really knowing who our characters are. There’s a little prologue giving us the backstory of Kunis’ eponymous Jupiter which is kind of well done, and in fact promises so much more than the film delivers, but beyond that the lack of character development is astonishing. We don’t care about them because we don’t understand them; the script wants us to follow and root for the blossoming relationship between Jupiter and Caine (aka Channing Tatum, aka The Wolf Man), but it’s so passively handled and underdeveloped that when the inevitable contrived smooching happens we cringe instead of care. Equally, Jupiter’s surprise at the whole situation (her being more of a queen than a nobody who scrubs toilets) is dealt with through a couple of offhand questions and barely convincing gasps. It feels like the equivalent of falling asleep for a few minutes and missing an important piece of exposition, only those pieces aren’t even here. You can sit upright at attention through the entire film and you’ll still be at a loss. It’s not necessarily boring, interestingly, just dull and infinitely un-involving. It’s too serious for its own good as it attempts to be some kind of epic space opera with inflections of Star Wars, but it surely speaks volumes that by the climactic action sequence all you’re left to do is sit there and wonder why you don’t care about anything that’s happening. You don’t care about what the hero’s doing, you don’t care about what the villain’s doing (even with the spectacular scenery chewage from Eddie Redmayne), you don’t even care about what the title character’s up to. The film takes two hours of your time and does nothing with it. Absolutely nothing.